Purpose: To determine the efficacy of hard, liquid, and soft splints in the management of myofascial pain dysfunction syndrome. Materials and Methods: In this randomized clinical trial, 45 patients with myofascial pain were diagnosed and were randomly assigned into three groups of 15 patients each. Group 1 - subjects were given hard splint, Group 2 - soft splint, and Group 3 - liquid oral splint for 3 months. Subjective pain analysis using Modified Symptom Severity Index (Mod-SSI) and objective pain analysis muscle palpation was performed at 7 days, 1 month, 2 months, and 3 months after splint insertion. The changes in mean pain value by both methods, in all three groups, were analyzed with Tukey test and Kruskal-Wallis H-test, respectively (P < 0.05). Results: Both Mod-SSI and palpation scores showed statistically significant reduction in pain for all three groups at the end of 3 months. However, the hard splints proved to be very effective in a shorter period of time, followed by liquid splints and finally soft splints. Conclusion: The result of this study advocates the use of any one of the three types of the occlusal splints in the therapeutic management of myofascial pain due to temporomandibular disorders. Hard acrylic-resin appliances have consistently been shown to be effective. ,,, On the other hand, investigations have shown that soft appliances are effective for the reduction of muscle pain, ,, temporomandibular joint (TMJ) clicking,  and headache. Hydrostatic appliance was designed by Lerman  over 30 years ago. In its original form, it consisted of bilateral water-filled plastic chambers attached to an acrylic palatal appliance, and the patient's posterior teeth would occlude with these chambers. Later, this was modified to become a device that could be retained under the upper lip, whereas the fluid chambers could be positioned between maxillary and mandibular posterior teeth. Most of the occlusal splints currently in use are either the hard or soft splints. Hard splints have an advantage of having an occluding surface that is hard enough that does not lose; it is fit and thereby lasts longer. Soft splints are simple to fabricate and have a soft occlusal surface that can be easily adjusted to adequate contact pattern. Hard splints can sometimes cause significant occlusal changes, which is not acceptable. Soft splints can aggravate bruxism,  may be due to premature posterior contacts related to the fact that these splints cannot be balanced. There are conflict of reports regarding the efficacy of different kinds of splints; it is difficult for clinicians to make evidence-based decisions regarding splint therapy because few randomized controlled clinical trials have compared different occlusal splint designs, including a "placebo" splint. , In this context, this study was carried out to study the efficacy of hard, liquid, and soft splints in the management of myofascial pain dysfunction syndrome. Ethical clearance was approved by the Institutional Review Board. Informed consent was obtained from each patient prior to participation in this study. Myofascial pain with limited opening. Should have at least six natural teeth in each quadrant. Subject not willing to accept treatment. The splints were fabricated with 3 mm thickness of acrylic between the maxillary and mandibular posterior teeth. These were stabilization type of splints. The splints were adjusted to create uniform occlusal contact of the centric cusps against the splint on all occluding posterior teeth, anterior teeth was in contact with the splint and provided a mutually protected occlusion [Figure 1]. A soft occlusal splint was fabricated from a 3 mm thick, soft polyvinyl sheet. The fabrication was done in a vacuum former, pressure-molding device (BIOSTAR ® SCHEU-DENTAL GmbH, Iserlohn, Germany) with a thermally controlled infrared heater over the mandibular cast and occlusal contacts were neutralized [Figure 2]. Readily available liquid occlusal splints (Aqualizer™, BVM Meditech Pvt. Ltd., New Delhi, India) were given to these subjects [Figure 3]. Study period was for 3 months with evaluation at 7 days, 1 month, 2 months, and 3 months after splint insertion. Patients were instructed to wear splint for 24 h a day for 7 days and taken out during meals. Each patient was evaluated according to the subjective and objective assessment. The obtained data were subjected to statistical analysis using IBM SPSS software (version 20.0, Chicago, IL, USA). Tukey test was used to compare the values of the Mod-SSI between three groups at all times. Kruskal-Wallis H-test was used to analyze the scores of digital palpation, both between groups and each groups at all times. Differences were considered statistically significant at P ≤ 0.05. The sample included 45 subjects (15 in each group) the Mod-SSI score showed statistically significant reduction for all three groups reflecting patients' improvement in muscle pain with hard, soft, and liquid supported splints. The hard splints proved to be very effective in a shorter period of time. 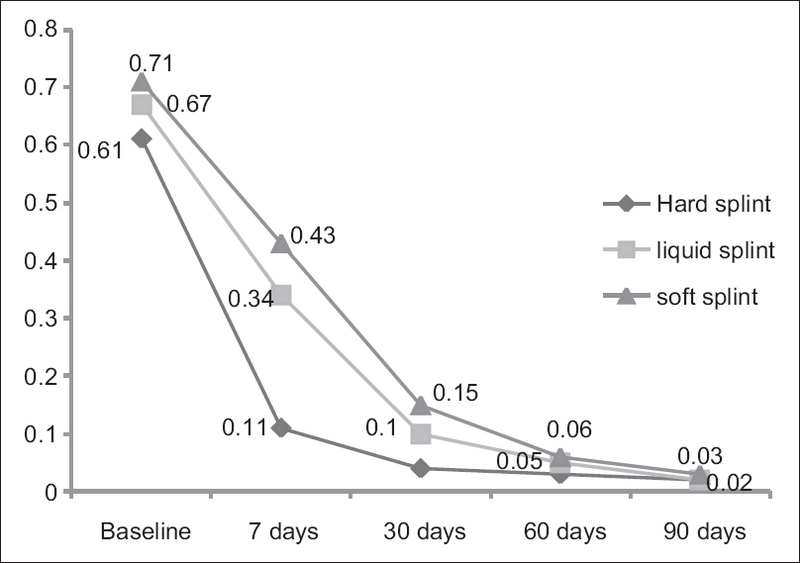 From baseline to 7-day interval the curve for the hard splints showed a steep change. Whereas the soft and liquid splints showed much more gradual change from baseline to the 7-day interval and was rhythmic thereafter. However, from baseline to 90-day interval, all the three groups showed a considerable and comparable decrease in Mod-SSI scores. The results for objective palpation also showed statistically significant difference between baseline and 90 days for all three groups, i.e., hard, soft, and liquid splints. For initial few days liquid splints was better followed by hard and soft splints. 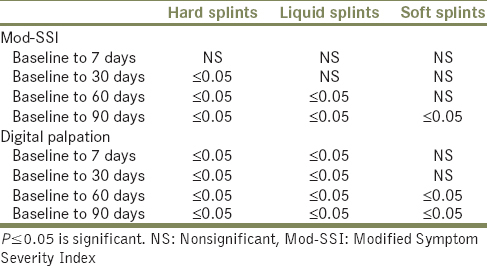 However, hard splints were more effective in shorter duration of time followed by liquid splints and lastly soft splints [Table 1] and [Table 2], [Figure 4] and [Figure 5]. Treatments for TMDs are wide ranging and are directed primarily toward relief from persistent orofacial pain. ,, Due to difficulty in determining the etiology and the possibility that the symptoms are secondary to some other disorders of the TMJ or muscles of mastication initial treatment given should be reversible. Tsuga et al. (1989) had done a study on hard splints and found that it is ineffective in reducing muscle pain,  which is in contrast with our study. In the present study, hard splints were more effective compared to soft and liquid splints, showing significant difference throughout the study period. In 1988, a study done by Harkins et al. concluded that soft splints had a reduction in facial myalgia. In our study, soft splints were effective, but when compared to liquid and hard splints it was less effective. 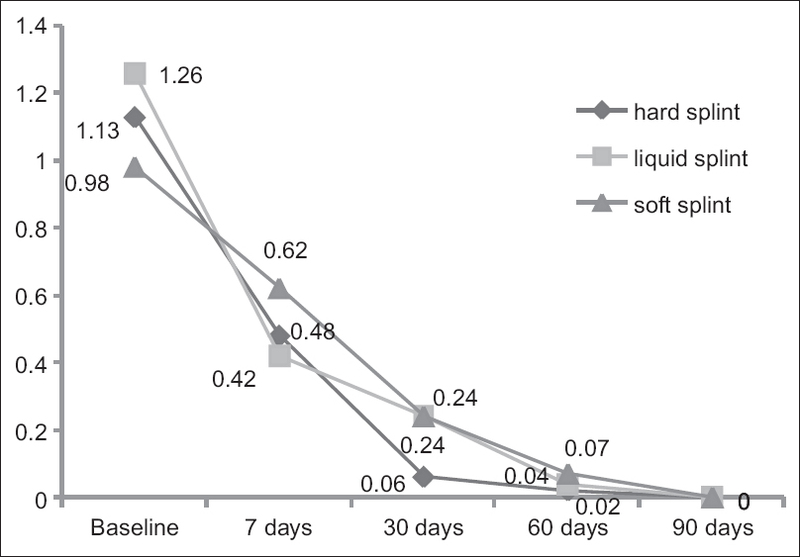 For soft splints, the change was much more gradual from baseline to 7-day interval and was rhythmic thereafter. A study done by Nevarro et al. (1985) had concluded that soft splints are ineffective,  and in another study done by Okeson (1987) on nocturnal electromyogram comparison of hard and soft reported significantly less effect with soft splints,  but our study found that soft splints are effective in reducing the symptoms of myofascial pain although the time taken by them was slightly longer as compared to the hard and liquid splints. Macedo and Mello (2002) evaluated the efficacy of the hydrostatic splint Aqualizer™, microcurrent electrical nerve stimulation (MENS) and transcutaneous electrical neural stimulation (TENS) therapies in patients with TMD in acute situations and concluded that the MENS and the hydrostatic splint were more effective than TENS,  which is consistent with our study, where liquid supported splint was more effective compare to the soft splints. Although the present study supports the use of hard, soft, and liquid splints in the management of myofascial pain dysfunction syndrome, further research is necessary to investigate the most appropriate usage regime of different types of splints, the different design of splints and also the EMG activity following the splint usage. This study advocates the use of occlusal splint therapy for the management of myofascial pain. It is simple, with fewer side effects, cost effective, noninvasive, and better patient compliance. The results showed that all three types, i.e. hard, soft, and liquid occlusal splints reduced the Mod-SSI scores and Digital Palpation scores thereby proving that the type of splint did not have an effect on the overall results among the three groups. The findings from this study suggest the clinicians to consider occlusal splints as a therapeutic protocol when managing patients with myofascial pain dysfunction. Türp JC, Komine F, Hugger A. Efficacy of stabilization splints for the management of patients with masticatory muscle pain: A qualitative systematic review. Clin Oral Investig 2004;8:179-95. Clark GT. A critical evaluation of orthopedic interocclusal appliance therapy: Design, theory, and overall effectiveness. J Am Dent Assoc 1984;108:359-64. Greene CS, Laskin DM. Splint therapy for the myofascial pain - Dysfunction (MPD) syndrome: A comparative study. J Am Dent Assoc 1972;84:624-8. Suvinen T, Reade P. Prognostic features of value in the management of temporomandibular joint pain-dysfunction syndrome by occlusal splint therapy. J Prosthet Dent 1989;61:355-61. Lundh H, Westesson PL, Eriksson L, Brooks SL. Temporomandibular joint disk displacement without reduction. Treatment with flat occlusal splint versus no treatment. Oral Surg Oral Med Oral Pathol 1992;73:655-8. Carraro JJ, Caffesse RG. Effect of occlusal splints on TMJ symptomatology. J Prosthet Dent 1978;40:563-6. Block SL, Apfel M, Laskin DM. 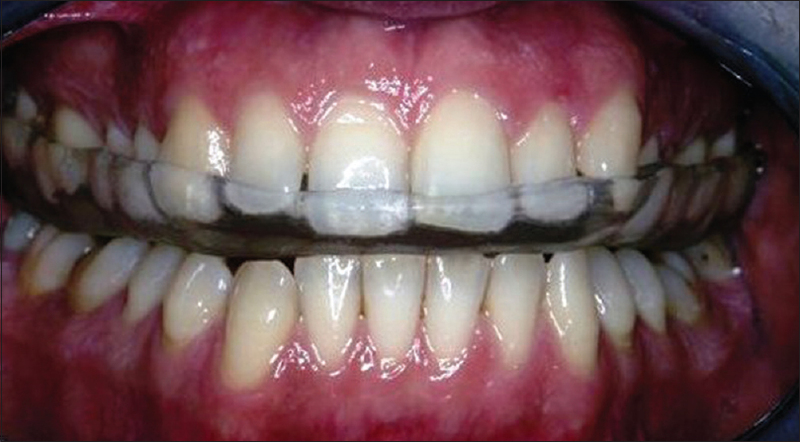 The use of a resilient rubber bite appliance in the treatment of MPD syndrome. [Abstract 71]. J Dent Res 1978;57:92. Harkins S, Marteney JL, Cueva O, Cueva L. Application of soft occlusal splints in patients suffering from clicking temporomandibular joints. Cranio 1988;6:71-6. Wright E, Anderson G, Schulte J. A randomized clinical trial of intraoral soft splints and palliative treatment for masticatory muscle pain. J Orofac Pain 1995;9:192-9. Quayle AA, Gray RJ, Metcalfe RJ, Guthrie E, Wastell D. Soft occlusal splint therapy in the treatment of migraine and other headaches. J Dent 1990;18:123-9. Lerman MD. The hydrostatic appliance: A new approach to treatment of the TMJ pain-dysfunction syndrome. J Am Dent Assoc 1974;89:1343-50. Kroghpoulsen W. Treatment of oro-mandibular dysfunction by means of occlusal splints. Scanodont 1981;1:5-13. Yadav S, Karani JT. The essentials of occlusal splint therapy. Int J Prosthet Dent 2011;2:12-21. Okeson JP. 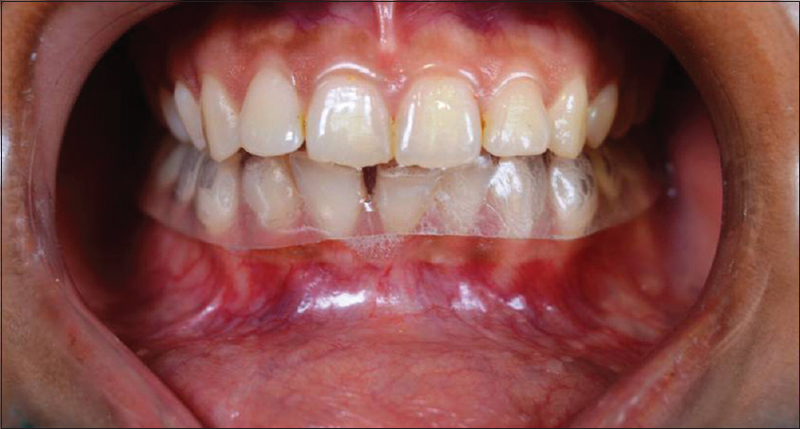 The effects of hard and soft occlusal splints on nocturnal bruxism. J Am Dent Assoc 1987;114:788-91. The Revolutionary Aqualizer Self-Adjusting Oral Splint. New Harmony Between Bite and Body: TMJ Pain Relief and Treatment with Aqualizer ® Dental Splints. Available from: http://www.aqualizer.com/html/aqualizer.html. [Last accessed on 2013 Feb 17]. Truelove E, Huggins KH, Mancl L, Dworkin SF. The efficacy of traditional, low-cost and nonsplint therapies for temporomandibular disorder: A randomized controlled trial. J Am Dent Assoc 2006;137:1099-107. Scopel V, Alves da Costa GS, Urias D. An electromyographic study of masseter and anterior temporalis muscles in extra-articular myogenous TMJ pain patients compared to an asymptomatic and normal population. Cranio 2005;23:194-203. Nixdorf DR, John MT, Wall MM, Fricton JR, Schiffman EL. Psychometric properties of the modified Symptom Severity Index (SSI). J Oral Rehabil 2010;37:11-20. American Academy of Orofacial Pain. Differential diagnosis and management considerations of temporomandibular disorders. In: Okeson JP, editor. Orofacial Pain: Guidelines for Assessment, Diagnosis, and Management. Chicago: Quintessence; 1996. p. 113-84. Ohrbach R, Burgess J. Temporomandibular disorders an orofacial pain. In: Conn HF, Rakel RE, editors. Conn' Current Therapy. 51 th ed. Philadelphia: Saunders; 1999. p. 997-1004. Naikmasur V, Bhargava P, Guttal K, Burde K. Soft occlusal splint therapy in the management of myofascial pain dysfunction syndrome: A follow-up study. Indian J Dent Res 2008;19:196-203. Ramfjord S, Ash MM. Occlusion. 3 rd ed. Philadelphia: WB Saunders; 1983. p. 359-83. Wagner EP, Crandall SK, Oliver RB. Splints. In: Morgan DH, House LR, Hall WP, Vamvas SJ, editors. Diseases of the Temporomandibular Apparatus: A Multidisciplinary Approach. St. Louis: CV Mosby; 1982. p. 265-77. Okeson JP, Kemper JT, Moody PM. A study of the use of occlusion splints in the treatment of acute and chronic patients with craniomandibular disorders. J Prosthet Dent 1982;48:708-12. Tsuga K, Akagawa Y, Sakaguchi R, Tsuru H. A short-term evaluation of the effectiveness of stabilization-type occlusal splint therapy for specific symptoms of temporomandibular joint dysfunction syndrome. J Prosthet Dent 1989;61:610-3. Nevarro E, Barghi N, Rey R. Clinical evaluation of maxillary hard and resilient occlusal splints. J Dent Res 1985;1246:313. Davies SJ, Gray RJ. The pattern of splint usage in the management of two common temporomandibular disorders. Part II: The stabilisation splint in the treatment of pain dysfunction syndrome. Br Dent J 1997;183:247-51. Pettengill CA, Growney MR Jr, Schoff R, Kenworthy CR. A pilot study comparing the efficacy of hard and soft stabilizing appliances in treating patients with temporomandibular disorders. J Prosthet Dent 1998;79:165-8. Macedo JF, Mello EB. Therapeutic of urgency in temporomandibular disorders. Rev ATMservice 2002;2:22-8. Alencar F Jr, Becker A. Evaluation of different occlusal splints and counselling in the management of myofascial pain dysfunction. J Oral Rehabil 2009;36:79-85.